Where is all the protein going? Swelling disease, ‘swelsiekte’ in Angora goats is the acute onset of severe subcutaneous oedema (fluid) of the lower body parts ventral neck, chest and abdomen, front and hind legs. The swelling is cold, pits on pressure and is painless. The first cases of swelling disease in South African Angora goats have been reported during the early 1970’s. However, no conclusive evidence had been found to establish the cause of the disease. From previous research one of the common factors that can be extracted from the data is a relatively consistent finding of a reduced plasma protein level. The plasma of oedematous goats showed a lower total protein concentration, a lower colloid osmotic pressure, lower plasma albumin levels and a lower albumin:globulin (a:g) ratio than that of normal goats. Mitchel, Hattingh,Ganhoa (1983) suggested that oedema was primarily due to hypoproteineamia as well as a higher capillary permeability. Vermeulen (1986) - Experiments were conducted where Angora goats were infected with Ostertagia circumcincta (Brown stomach worm) larvae at varying doses. 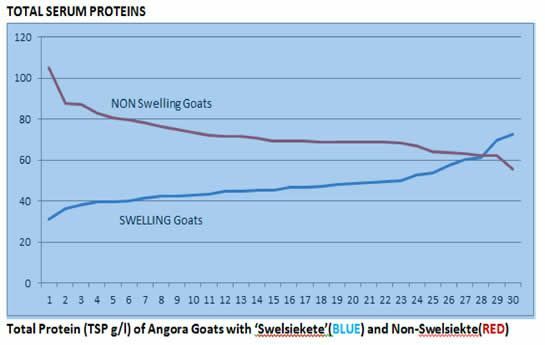 In all trials, all goats infected with Ostertagia circumcincta had a reduced plasma protein level. The low TPP values were most noticeable just before, during and after the swelling. 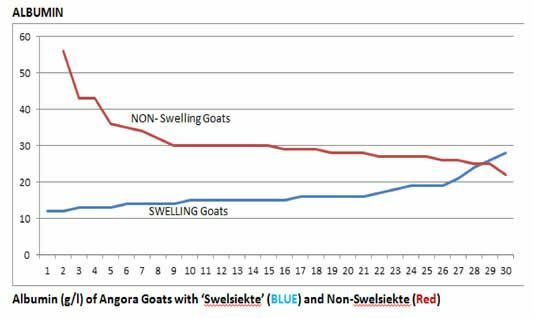 Snyman & A. Snyman (2005)‘The role of Brown stomach worm (Ostertagia circumcincta), coccidiosis and dietary protein level in the development of swelling disease in Angora goat kids’ concluded: Goats that did develop moderate oedema had lower TPP levels throughout the experimental period. 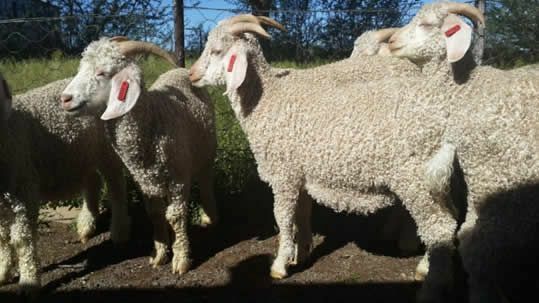 In 2015 the South African Mohair Growers Association (SAMGA) Veterinarian sampled 3 outbreaks of ‘Swelsiekte’ on different flocks under different conditions which confirmed the low plasma protein levels. Young ewes grazing on Lucerne lands. 10 goats with ‘Swelsiekte’ and 10 without were sampled from each group (60 in total). Elevated white blood cell count (Wbc). A distinct difference in Total Serum Protein levels. 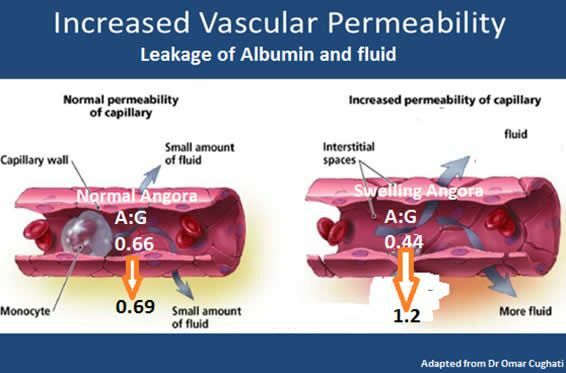 Albumin is largely responsible for maintaining intravascular oncotic (colloid osmotic) pressure, contributing up to 80%. A reduced oncotic pressure is clearly related to the occurrence of ‘Swelsiekte’. Where is the Albumin going? 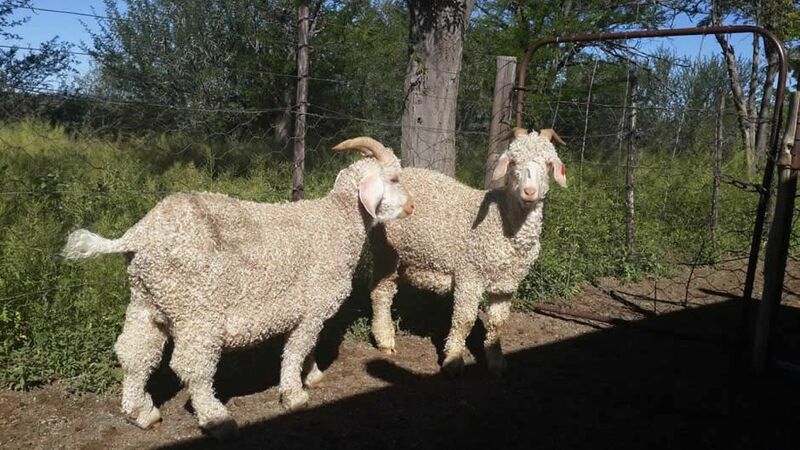 Blood samples taken from normal and swelling Angora goats at Grootfontein ( M.Snyman/A.Snyman) & swelling Angora goats (Mitchel, Hattingh,Ganhoa 1983) and blood normal and swelling Angora goats ( SAMGA vet M.Hobson 2015/2016). Oedema fluid analysis from swelling goats (Grootfontein M.Snyman, A.Snyman) and (Mitchel, Hattingh,Ganhoa 1983). Interstitial fluid from normal Angora goats (SAMGA Vet M.Hobson 2017). Under normal circumstances in various species documented the a:g ratio of interstitial fluid is not largely different from that of plasma. (Y.Zurovsky, G.Mitchell and J.Hatting 1994). This is reflected in the figures from Rabbits (Y.Zurovsky, G.Mitchell and J.Hatting 1994), Rats (Coetzee et al 1982), Boergoats (G.Mitchell, J.Hattingh, M.F. Ganhao 1983) and Angora goats (this study). The plasma and Interstitial a:g ratio should generally be relatively similar, but this is not the case in swelling Angora goats. What causes the Albumin:Globulin ratio to be so different in SWELLING disease? This is due to the albumin concentration reducing to a lesser extent than globulin after dilution so the a:g ratio increases. A low oncotic pressure (reduced albumin) in the plasma of ‘swelsiekte ‘ goats would cause fluid to filter into the interstitial space through the capillary walls and lower the concentration of interstitial proteins (albumin and globulin) to a similar extent. 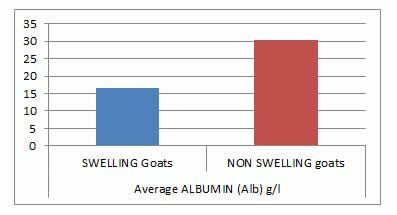 If there had been no leakage of albumin through the capillary wall then the a:g ratio in interstitial fluid of swelling goats (1.2) would have similar (diluted ) or lower than that of interstitial fluid of normal goats (0.69). It is in fact (1.2) which is 74% higher than a normal goat. Therefore there is clearly leakage of albumin as well as fluid through the capillary wall in swelling disease. The primary cause of ‘Swelsiekte’/Swelling disease is a CAPPILARY LEAK SYNDOME. Albumin is crossing the capillary wall (increased vascular permeability) from the plasma into the interstitial space to cause a significant reduction in intravascular oncotic pressure and a relative increase in extravascular oncotic pressure leading to swelling disease (‘Swelsiekte’) in Angora goats. Although some of the predisposing factors reported may contribute to a lower oncotic pressure; it is the increased capillary permeability that is the primary disease mechanism causing the hypoproteinaemia and significant reduction in plasma oncotic pressure. What causes this ‘capillary leak’ and what can be done to prevent and treat the disease condition? The following farmers for allowing samples to be taken from their Angora goats. Mitchell, G.; Hattingh, J.; Ganhao, M.F The composition of plasma and interstitial fluid of goats with swelling disease. Journal of the South African Veterinary Association (1983) 54 No.3, 181-183 (En). MRC/University Circulation Research.Unit, Department of Physiology, University of the Witwatersrand, 2001 Johannesburg, Republic of South Africa. GUYTON, A. C. (1963). A concept of negative interstitial fluid pressure based on pressures in implanted perforated capsules. Circulation Research 12, 399-414.